Hermann von Glenck, a Swiss composer and conductor born in 1883 in Zürich makes a surprising but welcome bow via this Guild issue. Success came pretty early, particularly as a conductor, having in 1904 been engaged to conduct one of his own works in a Paris concert. Soon after, he found himself directing the leading theatre in Metz in both opera and stage productions. After this initial success, von Glenck's career followed a somewhat familiar pattern of a promising musician in the first decade of the 20th century. His precocious talents, however enabled him in acquiring important conducting posts in several parts of Germany, the highlight being an engagement to conduct the Berlin Philharmonic in a 1908 programme. During this same he was appointed director of the Stuttgart Opera, a post he occupied for 3 years until a serious illness put a temporary halt to von Glenck's career. In the 20's, now fully recovered, he settled near Munich, and up to his death in 1952 in Switzerland at the age of 69, he was kept busy with numerous requests to conduct all over Germany. As a composer, his output is not, what you would call prolific, but the limited corpus of works to come out from his pen are full of expressive emotions encapsulated in a frame of structural strength and contrapuntal dexterity. The chamber works in this album are all pieces evident of a refined craftsman, particularly the Serenade for flute, viola and harp. The unusual combination of instruments employed in this composition gives the impression that it is a slight work, but repeated hearings reward the listener with an intense inner feeling of calm and joy. The other important work on this album is the Variation Suite, Op. 17, a powerful and highly original work written in 1918. 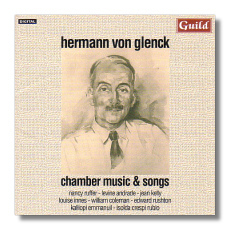 The composer revised it in 1930 and the version we have here is von Glenck's own for two pianos. The 10 songs that complete the programme are in turn dramatic and atmospheric, evoking a world of forlorn dreams shrouded in misty doubts. Exemplary performances from all eight artists make this CD a welcome novelty indeed.